Above: The view of Linden Yards East, a public works storage facility, and downtown from the Van White stop. How many people will board the five proposed Southwest light rail stops outside of downtown in Minneapolis? Depends on how optimistic you are about transit-oriented development. Take the two stops closest to downtown, Royalston and Van White, where the Metropolitan Council has said that 2030 average weekday ridership will be just 273 and 310, respectively. Those are very low numbers, reflecting the fact that those stops are currently hard to access and surrounded by little more than industrial land. Despite that, developers have expressed interest in transforming the areas with new housing and offices. 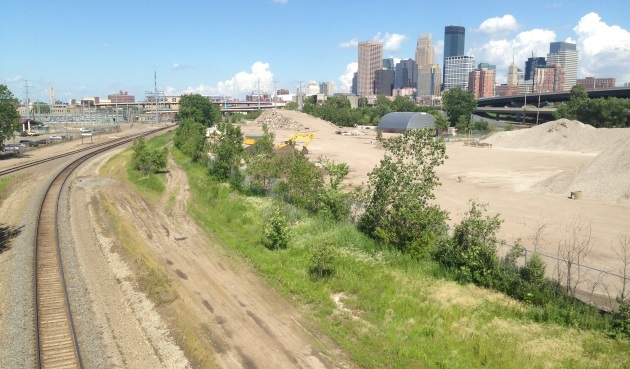 "Other than the 21st Street station, we expect some level of development at each of the Minneapolis stations," city spokesman Casper Hill said a statement, cautioning it will be less than what's anticipated along Central Corridor. But under guidance from the Federal Transit Administration, forecasters focus on the current population and employment data rather than development goals, said Mark Filipi, who oversees forecasting for the Met Council. That's because the FTA has been burned in the past by overzealous development projections in the 1960s and 1970s. Above: The Metropolitan Council's ridership forecasts, excluding the 21st Street station. “They’re saying you have to be able to justify the use of the line, the ridership, based on just the normal growth you would anticipate before we’ll fund it," Filipi said. "And then if you can prove that, and you get more development and more population, households or employment in the corridor, then it’s a win-win for both sides." So the agency makes its best guess based on a model that factors the number of likely trips to and from the area, where people want to travel, the time difference of taking transit and how people make transportation decisions. They also factor where the city has previously said growth would occur within so-called "transportation analysis zones." The Royalston stop is currently a parkway lined by industrial buildings, in the shadow of Target Field and a short walk from the city's farmers market. The city's transit-oriented development director, David Frank, said recently that developers are already talking to local property owners like Stark Electronics and United Noodle Wholesale about likely residential development. Robert Salmen, who owns a property on the corner, has received some of those calls. "There’s a lot of people that are sniffing around looking for development opportunities," said Salmen, who won't be ready to sell for another five or 10 years because several of his tenants have long-term leases. "I think there’s going to be apartments and mid-rise office where those buildings sit in five years," Salmen said. Above: The Royalston stop, featuring a view of Target Field. The Van White stop is even more barren, now featuring little more than a dumping ground for the city's public works department and the city's impound lot. But Ryan Companies has a development agreement to build offices and residential properties on a massive city-owned parcel there known as Linden Yards West. The city is also planning to reduce the footprint of its impound lot to make room for development, and residents hope that new bus routing will bring riders from West Broadway. The city identified the Van White area as a "Growth Center" in its 2009 comprehensive plan. Filipi left it unclear whether that was factored into the forecasts, but said existing travel patterns could still have dampened ridership figures. Russ Adams with the Alliance for Metropolitan Stability, which fought for extra stops in low-income areas along the Central Corridor, said the low Van White ridership figures ignore the neighborhood's long-term plan for the Basset Creek Valley area. The plan envisions office buildings and civic uses on the eastern portion of the site. “To call that the forecast means that everything will exceed forecast if there’s any economic development affects whatsoever, because you’re not accounting for any of them or very little of them when you’re doing this," Levinson said. It stands in contrast to the city's projections for a Nicollet-Central streetcar line, Levinson said, which has been sold as an economic development tool. “I would claim that the streetcar forecasts are more in the line of advocacy forecasting. They were trying to get people to buy into the idea of this," Levinson said, noting that they would likely have to be adjusted if the project advances in a quest for federal funding.